$1,000 of insurance coverage is available at absolutely no cost to you. Exclusively for credit union members. 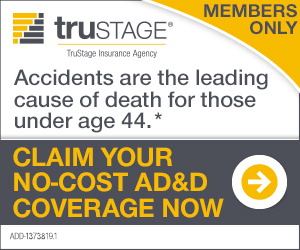 Visit TruStage or call 1-888-888-3942 to activate this coverage. This can be a valuable and affordable supplement to life insurance and pays a cash benefit in the event of a covered insury or death due to an accident. Designed for credit union members, to help your portect the achievements and aspirations of those who matter most in your life. Life insurance is an important part of a financial safety net you can provide your loved ones in the event of your passing. Life insurance helps provide peace of mind, knowing that your beneficiaries will receive money, when they need it most. Life insurance pays your beneficiaries money, which can be used for any purpose.